Over the past year, video marketing’s popularity has rapidly accelerated with no apparent signs of slowing down. All the better for us! Not only are we a content creation platform specializing in video animation, but we love writing blogs about video marketing! You may recall we did a similar blog post about our 5 most popular video animation blog posts, this blog, however, is focused on the marketing side of video animation. 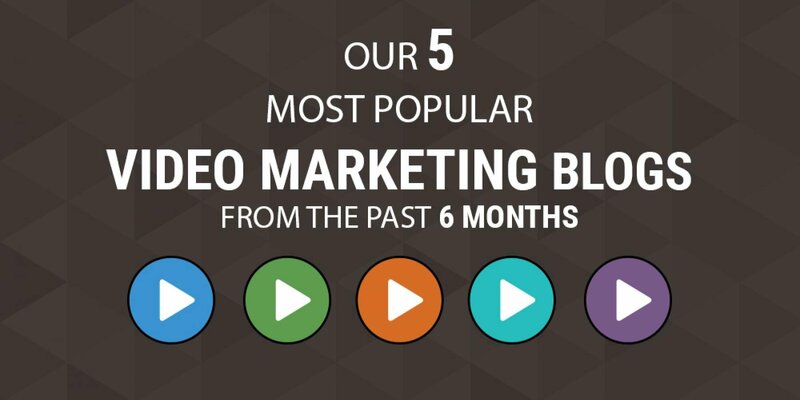 Here are our 5 most popular video marketing blogs from the past 6 months. Email still carries a significant value to businesses around the world. The one problem that faces many marketers and businesses today, however, is how to stand out. How do you make an impression on your audience when there is dozen of other similar emails in their inbox? That’s where video comes in! Did you know that just having the word “video” in your subject field can increase open rates by 19%? Or that there is a 41% chance that subscribers will share or forward your email if a video has been included? So how exactly can you include your video in your email? Well, there are three popular choices. The first being embedding your video through HTML5, which gives your audiences the opportunity to play and view the video from within the email. The only downfall being HTLM5 at this point in time is not compatible with all email clients. Another option is to add a static image with a link to your online video. By far the simplest method and arguably the most secure. The final way to add a video to your email is through the use of a GIF. Like with a static image, your GIF will link out to your online video. To learn more about how to use video in email marketing, check out our blog. Animations help tell a story. They help bring concepts and ideas to life. Animated videos use the power of storytelling to help make stories more memorable. Animations are easy to understand and look professional. Your video can display clear information in a simple manner. Animated videos appeal to all. Not only can animations be insightful but they tend to be simple. Even adults love the imagination and creativity of animated videos. Animation doesn’t cap creativity. There are no limitations when it comes to creating your marketing video. Sky’s the limit! You can read our blog to find out in more detail about the 4 reasons to use clever animations in video marketing. 3) How to make marketing videos that people will love! Video is without a doubt one of the most engaging and shareable forms of content marketing. Brands from all industries have jumped on the video bandwagon and started creating marketing videos. That being said, there are still a lot of companies out there who feel that creating a video marketing campaign is out of their budget and skill reach. They couldn’t be more wrong. Creating marketing videos has never been easier and more accessible. So how can you create a marketing video that people will love, without the use of professional equipment or actors? For starters, you can use animations! Not only do people love animations, but they are simple, insightful and appeal to almost everyone. Need a content creation platform? Sign up for Moovly and give it a try! The key to standing out amongst your competitors is to show off your personality. Today, video marketing has become one of the most sought out methods amongst marketers to increase a brand’s online presence and drive more traffic. Having said that, you can’t just upload any random video and expect your website to be bombarded with immediate traffic. Some steps and tricks need to be taking into consideration, to ensure your video is seen and acts as the main driving force in attracting and retaining users to your website. Video quality is key. Quality plays a major role in the likelihood of your video being shared and engaged with. Timing is everything. The first 10 seconds are the most important for your online video. Make them count. Include a clear call-to-action. How else can you inform your viewers what you want from them? Use optimized keywords. Your title, video tags, and video description should all have optimized keywords. Remember search engines can’t see your video, so it relies on the metadata. To find out more ways, read our full list on how to drive more traffic with video here. Our emotions play a massive role in what marketing videos we enjoy watching. Think back to any online advert that made you happy, or made you sad. Video Marketers will use specific words, music and visuals to evoke your emotions. More specifically, there are 8 emotional triggers, that video marketers just love to evoke. Joy. Most people enjoy watching videos that will put a smile on their face and brighten their day. Pride. Some of the greatest video marketing campaigns have been created around the idea of making you feel better about yourself. Amusement. People tend to remember online videos take to make them laugh or cheerful. Fear. Marketers like to identify fears that already exist. They like to empathize with that fear and then finally act to remove it with your contribution. To find out more about the full list of 8 powerful emotional triggers for video marketing, you can read our blog here. There is no disputing that online video is the future of content marketing. We will continue to publish blogs on video marketing to make sure that you stay up with any advances on the topic. For those of you who want to try their hand at creating an animated marketing video, why not sign up with Moovly? Register here for your free trial license and get started on bringing your animations to life!